A word of warning: Today’s talks were packed with information. The report got very long. I apologize in advance! Sebastian Kirsch from Google Switzerland conducted over 200 interviews, was member of the hiring committee, and trained engineers in interviewing. We can check off credibility at this point I think. When they started hiring SREs in the early days of that role there was no job description because the job did not exist before. In an interview your time is limited. So they can’t go into too much details and complexity. But there is a trick: Build a simple system and scale it up. Even simple systems become complex within minutes by just scaling them up. That can be used to talk about complexity even in time-bounded interviews. Sebastian didn’t solve the puzzle in his talk, as this was only a demonstration how easy it is to scale a simple question into a complex engineering challenge. How would one design such a question? Start with a very simple problem. Copy something. Process some data. Pass a message. It should be something from an area where you are familiar with. And then just scale up. 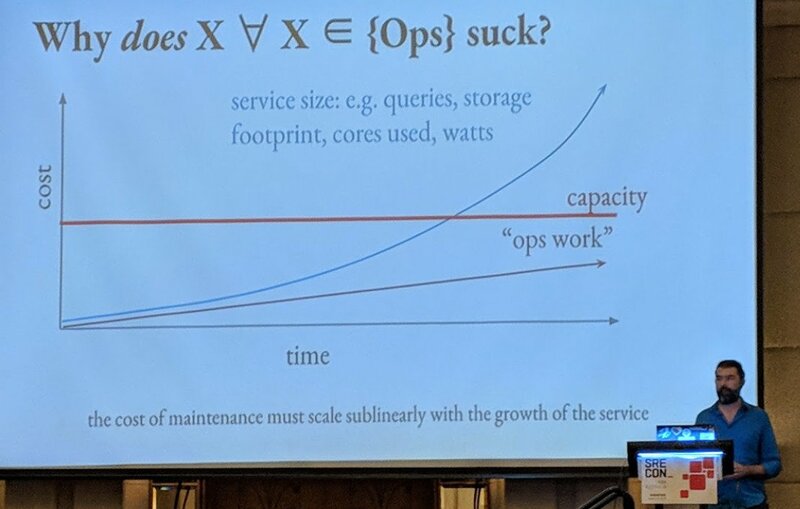 Add a crazy requirement so that the problem needs at least a hundred thousand machines to be solved. Next step then is to find the bottlenecks in the system. Typical bottlenecks are disk IO, network bandwidth, disk seek times. A good question has a couple of bottlenecks. Ideally, it should not be clear from the beginning what the bottleneck dimension is. Fun fact: Designing these questions becomes harder over time as hardware contains more magic nowadays. Compared to the past, current computers are supercomputers. Having tons of cores and unreasonable amounts of memory. A lot of problems fit into memory of a 96 core and 1.5TB RAM machine. And that is something that you can just click on Google Cloud Platform. Oh, and disk seeks? You can buy guaranteed IOPs on SSD on the cloud. Snap! Hardware takes all the fun out of engineering problems. Sebastian suggested to just make the problem bigger (oh, did I mention that we want to serve all humans and extraterrestrials? Design for that!) The other option the interviewer has is to limit the candidates option of machines. I like the first option better. We have IPv6, so multi-planet distributed systems should be at least addressable by now. Another challenge for the interviewer is that at some point maths (e.g. total bandwidth calculation) is going to happen. That has to be checked, while the interviewer has to take notes and think about the next steps already. Solution: Have a cheat sheet with pre-calculated values for the anticipated solutions. Also on the cheat sheet: Possible follow-up questions. Practice: Never go into an interview with a question that you have not tested. Testing on an external candidate is neither fair nor gives it the required amount of signal. The first iteration is probably way too simple or way too complex. The problem description could be misleading. Practice can iron out all of these problems and calibrate your expectations. Test the questions with your coworkers. Highly relatable! I remember how surprised I was how long it takes to solve one of our coding questions when you never seen it before. I once spend an hour with a candidate sorting an array and still got a ton of signal out of that. The hiring bar: The problem is not really whether or not a candidate is below or above the hiring bar. The problem is more that we do not know what the candidate’s skill level really is. So the hiring bar problem is more an uncertainty problem. There is a huge error bar or grey area. A lot of candidate will touch the hiring bar at some point. The interviewer’s job is to decrease uncertainty and become certain whether or not a candidate’s skill levels are below or above the hiring bar. It is a classification problem with a lot of uncertainty essentially. Interview time must be used to decrease uncertainty. Everything else is just time wasted. To gain as much signal as possible, start with making clear what the expectations are. This includes technical requirements. Furthermore, it includes making clear that you expect reasoning about choices and questions from the candidate to the interviewer. Careful steering enables the interviewer to use the time more effectively. Many candidates forget to provide concrete resource estimates (e.g. number of drives needed). Question: What goes on the purchase order for this system? Sometimes there are no clear boundaries between the systems and how they work together. Question: You have N teams of engineers that are going to implement the system. What entities should each team work on? Candidates may get stuck in precise arithmetics. So a hint could be to give roundings: A day consists of N seconds. Use that value to proceed. In the end, it is all about orders of magnitude. The magic bullet: Candidates use a standard technology because they think we ask for knowledge. Question: How does this technology work? How do we determine how well a candidate did? Go into the interview with expectations. Compare the results with the expectations. Have expectations for each axis or dimension you are looking for. Does the designed system solve the problem? (Often, the system solves a different problem. Woot?) Good candidates trade resource dimensions for each other. E.g. 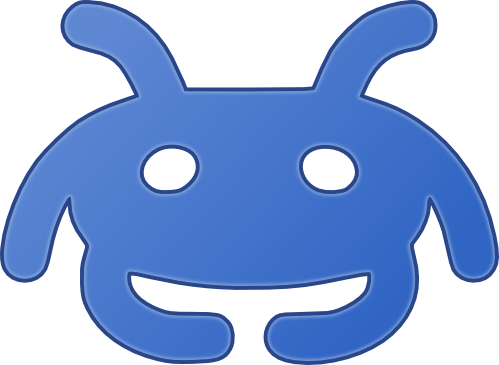 use more CPU time to reduce network bandwidth. Did the candidate think about a possible SLO? From the Q&A: Shall I read previous interview feedback on that candidate before going into the interview? Better not. It introduces an unfair bias and gives the first interviewers more weight in the process. At Google they do not propagate the actual feedback, but the topics, so that they minimize overlap without biasing the result. 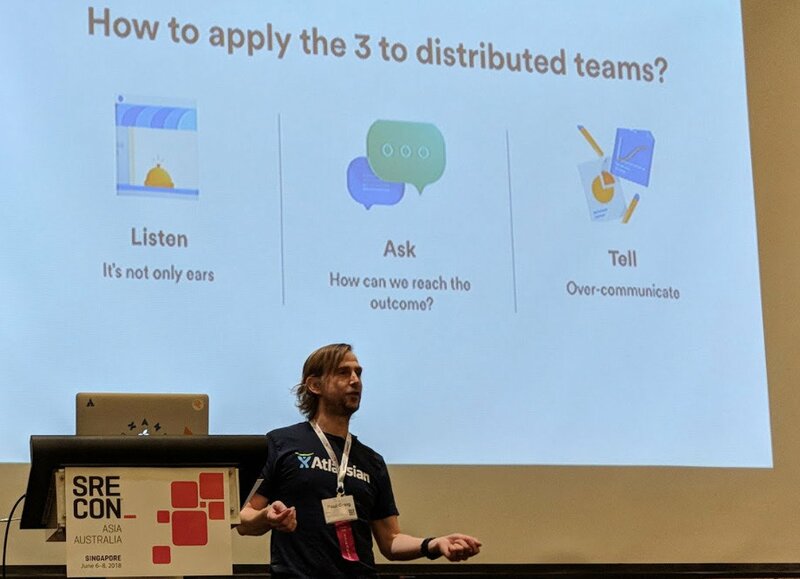 Paul Greig is an SRE lead at Atlassian and talked about the challenges one faces in managing a distributed teams. We are talking about 18 SREs, two Team Leads who manage two services distributed across three geographic regions. He started with the question what a distributed team is. His definition ranges from a single worker somewhere on the world to teams where everyone is in a different place collaborating over the Internet. Better On-call, because time zones. Friction and lack of cohesion: The divide leads to absence of communication sometimes. Duplication: When the right hand doesn’t know what the left hand does, work is often duplicated. Costs: Distributed teams are actually expensive. The impact may be a little lower than that of a team sitting in the same room. Imbalance: The day of a life in an engineer can be very different from that of another one. Paul visited his team members and found that they work very differently. Establish Trust. ”This is a huge one!” Paul said. Being present and asking questions (includes active listening) he built trust. Jumping to solving problems without establishing trust first doesn’t work. As leading a distributed team involves a lot of travel, you need to plan ahead to keep work and life in a healthy balance. Also, engineers sometimes like to travel to the HQ to mix and mingle. Scheduling one-on-ones at a time where it is suitable for the leader and the team member, who might be in a different time zone. Example: ”After I sent the kids to sleep I spent two hours on being present (online) for the team in a different time zone.” Allow teams some time to think about a problem and get to results. There is a time gap, naturally. However, at some point ask to wrap an issue up. It’s mostly about reasonable expectations. Participate rather than rushing the process. Local team vs. remote team: Working with the local team the whole day: How can I make sure that I give the same amount of attention to remote team members? Plan for delays in pull requests. The velocity of big projects can slow down if you are waiting for feedback from a different time zone (and that time zone is asleep currently). Is separating projects and assigning it to different time zones a solution? Not really! So in the retro they were introducing end-of-quarter demos, regardless of the project state, there had to be a demo. That gave the teams a common goal and brought velocity back into the project and kept everyone on the same page. We saw disheartening duplicate solutions to the same problem. Great for redundancy, but expensive. Inspiration: I want to see a thirst from the engineers of the team to arrive at a fantastic outcome. Leoren Tanyag from REA Group grew up with little exposure to technology which made her want to go into exactly this industry. She went through the graduate/internship program of REA and shared her experiences. REA acknowledges that school is different and an un-mentored environment is not something they want their people to be exposed to. They communicate expectations on what to learn and where to start. Of course the mentee has a say in driving the direction. Emphasis is on pairing with co-workers. On your first 6 weeks: I know what I’m doing. No, you don’t! On your first 6 months: I may know what I need to know, now I have to continually improve. Interestingly: Even after ten years people often look up to their mentors. Leoren reports that mentees expectations are often not very high. They are so happy that they can learn from someone they respect. So there is no excuse for an experienced engineer not to mentor. Even of you are not very experienced, there is something you can share and a mentee can learn from you. I can not agree more. I, personally, expect sharing knowledge from every engineer in my team. Mentoring is one form of that and it is everyone’s responsibility to make every other team member succeed. 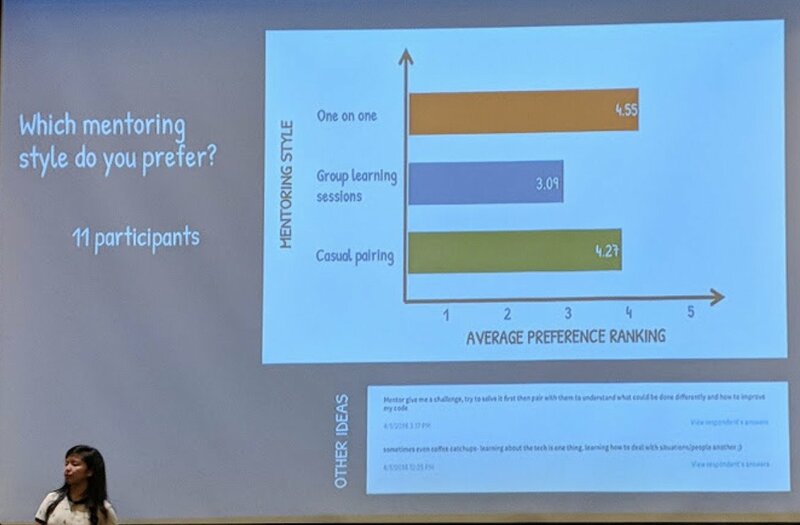 Group Learning sessions: More efficient if multiple mentees share the same interest (e.g. learning a new technology). Also, some mentees feel less pressure in a group and enjoy having a group to talk to afterwards. Interesting aspect I have not thought about before! Casual Pairing: Supports bonding and transfer hands-on knowledge. Communication heavy, obviously. Good Mentors come from those that have been mentored before. Start the trend! From Q&A: How should mentoring relationships be started? Driven my mentee or mentor? Leoren: We have a queue of people who agree to volunteer time. We use vouchers to get people in touch with each other. Lindsay Holmwood from Envato started with story from when he was a teenager and was challenged with a serious illness. From there it went up and down (storywise) including topics like emergency room, cancer, surgery leftovers remaining in the body, and open heart surgery. There was a mistake made in the treatment and it was made sure that the person doing the mistake would not practice medicine anymore. Years later, when he was running a cancer-related charity, he accidentally took down the website in the middle of one of the most important campaigns. He did not receive any punishment for that. Comparing these two stories, he realized that how an organisation responds to failure and errors was different here. Some look for someone to blame, some don’t. 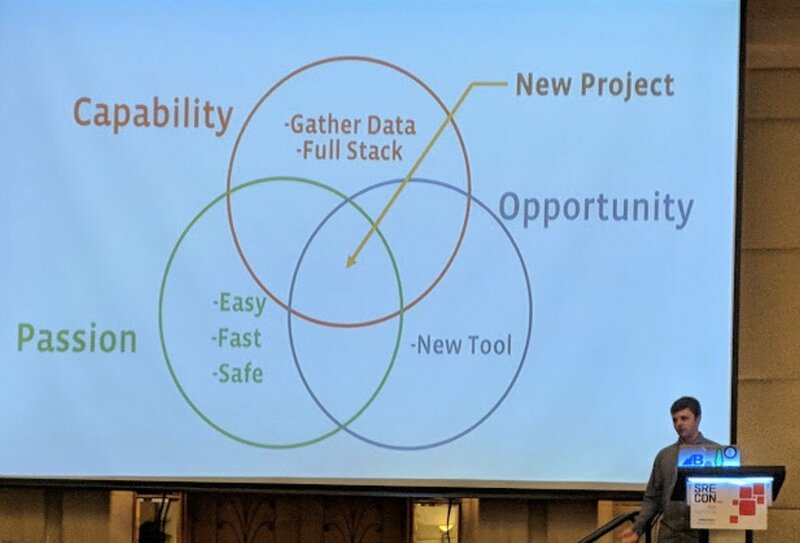 The narrative for safety here is the absence of failure (e.g. in process, technology, people). If you think this through, this maintains a culture where any three of these can be a danger. People are a harm to safety here. Not necessarily a nice environment to work in, right? This all refers to a bi-modal operation mode. It is either safe, or it is not working at all. In our industry, things are a bit different. Our systems are so large and complex, ther are always running in a partially degraded state. But they still work, often stil generating revenue, even though they are in a degraded state. That asks for a different culture. We have to embrace different perspectives, evn contradictory statements (think: views) about the state of a system can be both true at the same time. The people doing the frontline work, in our culture, focus on quality and delivery. But they do not focus on covering their mistakes. Why is a good word to use for talking about systems. Why did that action take so long? But it is a bad word to use in regards to people. It often carries some blame. Why didn’t you follow the runbooks? Be careful using Why, you do not want to question someones personality, right? How is better, but may be limiting the scope too much. How did that happen? What ties better with local rationality. The latter is a concept that assumes that people make trade-offs based on the limited information they had at the given time and in good intentions. Think about someone moving forward in a dark tunnel having a small flashlight. You never see the whole picture, only what you point the flashlight too. In hindsight, of course, things are always different. So what asks for how the tunnel looked like at the time you were inside it. Thinking of people as hazards ignores one truth: Sometimes bad things happen and no one is to blame. Things go right more often than they go wrong. Finger pointing is basically a cognicitve bias. It’s something we have little control over. Our brain (perception) makes trade-offs between timeliness and accuracy all the time when processing information. 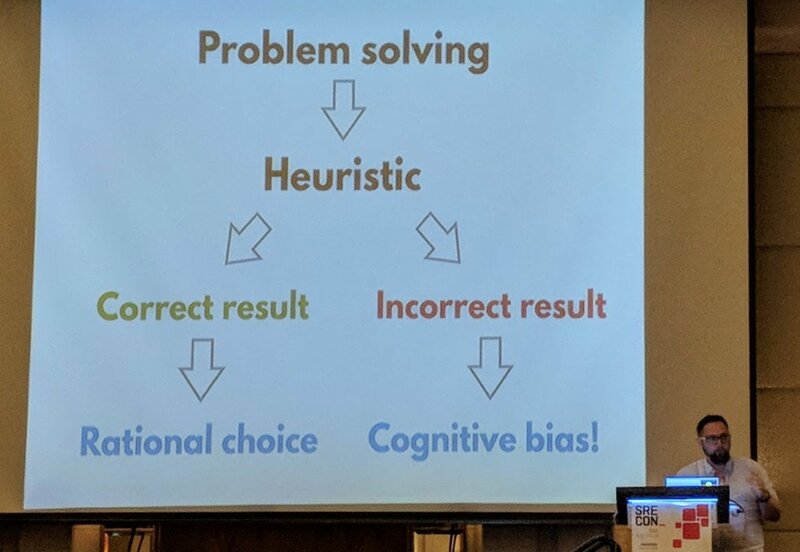 That brings problem solving down to heuristics often. Lot of psychology here! He played a classic in confirmation bias: The monkey. Knowing that, think about how well we will do during an incident? Hooray for those who are not biased. Spoiler: No one immune to bias. Another thing to watch out for: In hindsight we tend to assign a failure to a person, not a system. The more negative the outcome is, the more biased we are to blaming a person, not a system. 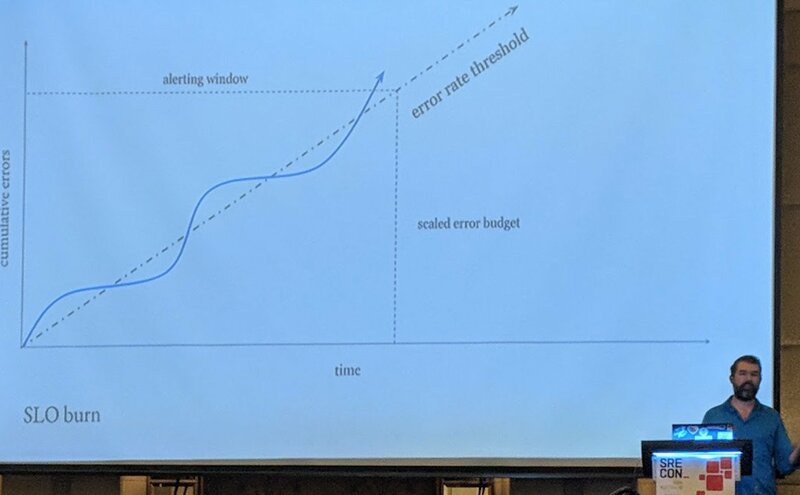 Yesterday evening, at the reception, I asked Jamie Wilkinson (Google) a ton of question related to a tricky SLO measurement problem we face at work currently. Every now and then he would refer to his upcoming talk. So I went into this one with expectations set high. He explained the differences of alerting on cause vs. alerting on symptons. While it is convenient to know exactly what went wrong (cause) it is much better to alert on symptons. Why? Because it results in less alerts and avoids alert fatigue much better. Every alert disturbs a persons life when on-call. And we care about people more than we care about a dying disk in the end, right? 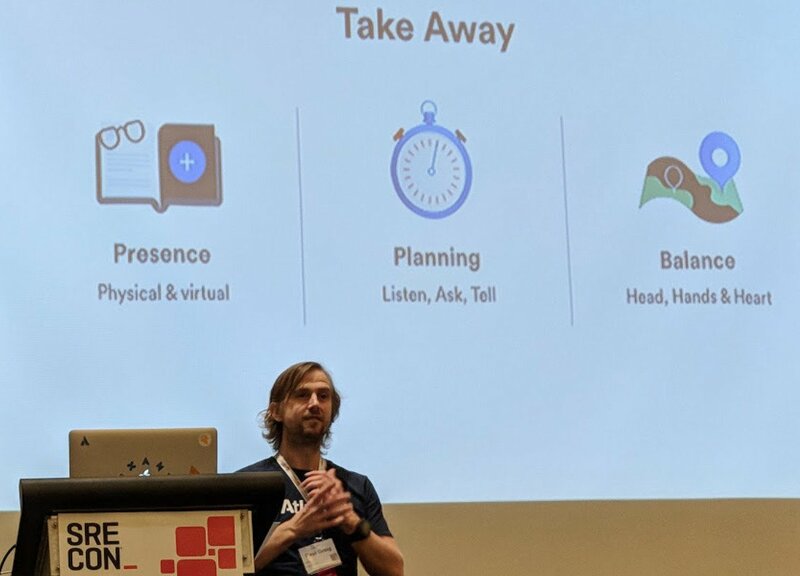 Focus on alerting on a very small set of expectations that matter for the users of the service. Do not focus on alerting on all the nitty-gritty details, timeouts, and other metrics that may cause a problem. How do we distinguish between a symptom and a cause? One rule is to ask yourself: Does this affect the users experience? For example, if you have reasonable latency, who cares about the depth of a queue in a backend system? No need to alert for that, we can solve it during office hours. Or maybe decide to not touch it at all, as it might just be fine. Back to the talk: Jamie introduced the concept of SLO burn rate. I like that very much. Alerting on the burn rate is something I definitely will bring back to my team in Munich. If we don’t use the error budget to our advantage, it will just be lost. Use the error budget! Espen Roth talked about how graduates are onboarded in Production Engineering at Facebook. And what challenges come with that. He was hired by Facebook right after school, without a previous internship there, so he experienced the process firsthand. New graduates build things from scratch in school. They ran small self-contained projects that they had to finish in time. They know about what is currently out there. What they lack is experience in maintaining a system on the long term. Teamwork is even more important in the job world and unlike school, in a job you are there for the long run. And sometimes you have little choice on what you have to work on. The grades don’t matter anymore, but impact does. Working in Production Engineering is very different from school. Internships are the ultimate interviews. Internships provide a long exposure to feedback and hiring a former intern requires little ramp-up. Mohit Suley (Microsoft) woke up the audience by asking a couple of questions to test our mental models before the actual talk started. The first mental model he talked about was the survivorship bias. 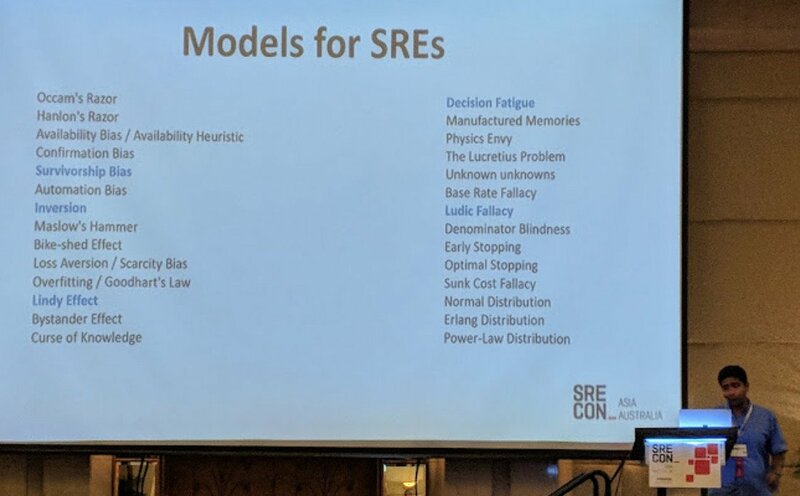 The connection to SRE is that survivorship bias can influence metrics. Then I learned about decision fatigue. So obviously, the capacity to make decisions decreases over time. A practical advice is, therefore, to not go online shopping when you’re on-call. It got better! If a thing has been proven over a long period of time, we call this the Lindy Effect. 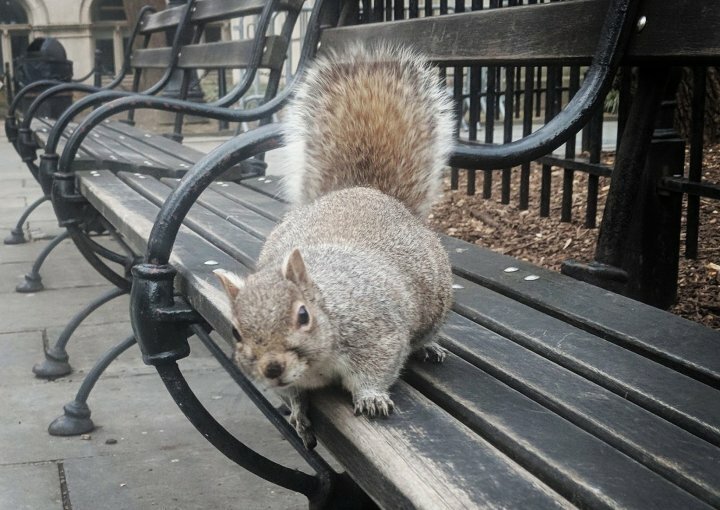 How to connect this to the SRE world? Mohit suggested that even in the age of cloud, client computing is not going down. And in fact, our devices are more powerful than ever. The cloud (remote compute) just grows faster. Another one: Email is still around in 2018. Probably here to stay. Learn more about rubrics and how I can use them to gain better signal from interviews. Managing a distributed team requires thoughtful and patience leadership. Keep mentoring. It means a lot to mentees. Also, being a mentor and/or a mentee is a learning experience. Humans are biased. Providing psychological safety is key to good leadership. Symptom based alerting. SLO burn rate alerting. It’s better for human health. It makes so much sense!